I feel like I’ve leveled up as an author. I mean, yes, I have three books published. Yes, I have two manuscripts that are in various stages of editing. Yes, I’m pre-writing book four, and yes, I have rough outline of the stand-alone novel. And that’s all well and good and awesome in its own way, but today was a whole new adventure for me. 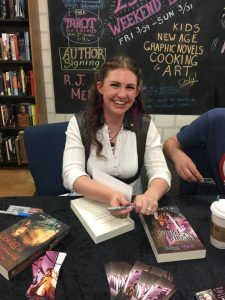 My first book signing at our local Open Book, and to my greatest joy, it was a smashing success! We walked in with four and a half boxes brimming with books, and left with two boxes that rattled a bit on the way out. Truly, I’m still a little stunned. And so very grateful for such an amazing first experience. I couldn’t do this without the support of readers like y’all, and every “hi”, every review, every purchase, every message at 2 am yelling at me for what choice a character made (true story, my phone practically blew up at 2 in the morning once because of a reader who was so invested, and it made me cackle in glee for the rest of the day), all those little gestures mean so much to me. It’s what keeps the fire in my belly. And I appreciate y’all so much more than you imagine. So, thank you, everyone. Thank you for coming out, thank you for reading, thank you for being awesome. And here’s to more book signings, and hopefully all over the nation! RJ has little spare time when she's not in "Mommy Mode", but she does enjoy reading, writing, pillow fights with her family and hunting Pokemon in the neighborhood with her hubby.